The team can consist of 1-4 US high school students. Each member should submit signed Parent Permission form. If you are participating as part of a class project, your teacher will be your Team Advisor. If you would like to participate individually, find a faculty member at your school who can advise you along the way. One person on your team should be designated as a team captain. This person will coordinate the submission of your entry and fill in the registration form. The team captain should be listed as Team Member 1 on the registration form. As described in The Challenge, your story has to contain a molecular and public health components. Think how you can connect the physiology and medicine, as well as current statistics about antibiotic resistance to the molecular processes that occur in bacteria. Use information on antibacterial resistance from the Learn section. Streamline this information to tell a coherent story that explains scientific concepts connecting them to the public health problems. At this step, it's also important to think about your audience. In this challenge, your target audience are fellow high school students who have some knowledge of biology, but have not studied the topic in greater detail. Think what they can relate to, and what would keep them interested. The American Association for the Advancement of Science recommends to always keep in mind the 3Ms when communicating science: a good message should be Miniature, Memorable, and Meaningful. There are many approaches to storytelling. You can use a real-life event or create a narrative story, as long as it includes the molecular component in a meaningful way. There are many public health aspects related to the aminoglycoside antibiotics. For example, even though the discovery of streptomycin was a major step in the fight against tuberculosis, multidrug resistant tuberculosis is still a major public health challenge. You can explore and research how anti-vaccination activism might influence the spread of resistant bacteria responsible for bacterial meningitis. If you like history, you might tell the story of the discovery of aminoglycosides, maybe highlighting how the Streptomyces griseus became the official New Jersey state microbe, and why this great discovery was only a short triumph in medicine. Find inspiration in popular science magazines, newspapers articles, or explore facts and statistics on antimicrobial resistance. Your team should brainstorm many ideas at this stage and choose one that appeals to you the most. It's also important at this stage to think about the 2-minute time constraint and how much information can be communicated effectively. A storyboard is a graphic organizer that sequentially shows how the story will unfold using the key elements for visuals and audio. The visual elements for your storyboard can be hand-drawn, but it's a good idea to plan how they will be framed in a shot. At this time, it's also a good idea to record at least a scratch version of narration/dialogs to make sure that the time allotted for each element is sufficient. Remember, you are teaching a complex subject to your audience. Speak in an understandable, level-appropriate way and pace your narration so that it allows audiences to listen and follow along. Incorporate some breaks; after each key concept is introduced to your viewers, they will need down time to process the information. Your storyboard can be shared with other students to get feedback and make adjustments. You have complete freedom for the visual style. Create animations, film footage, or add any creative components. The scoring rubric allots points for originality and creativity, so be sure you don't miss these marks. You should use an image/animation of a topic relevant protein structure from the PDB to illustrate the molecular component. 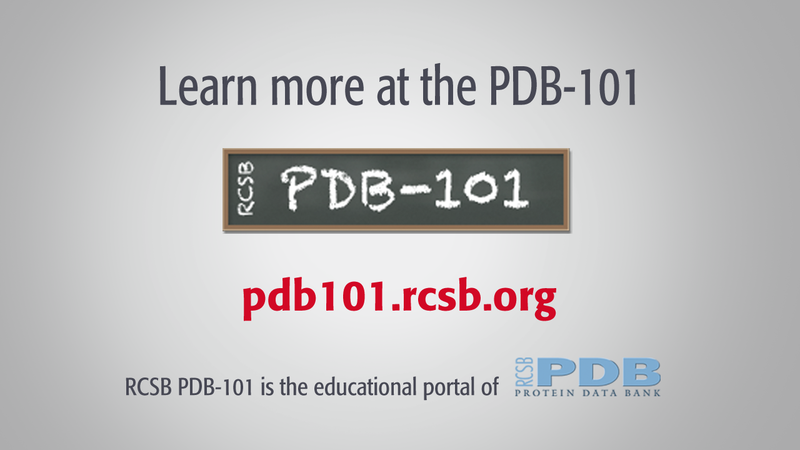 The PDB IDs of example structures are listed in Tables 1, 2, 3, and 4 in the Learn section. Each of the tables has a column “Visualization resources and tips” and provides links to Chimera sessions with preview images and web-based 3D views using NGL. You can download and open the Chimera sessions using UCSF Chimera. Use the tutorials available here and here to edit the sessions, create animations, or save custom pictures. Image caption; PDB ID of the protein shown; Image source: pdb101.rcsb.org. You should not use any copyrighted materials in your videos. Videos using copyrighted materials will be disqualified. If you don't create your artwork/music yourself, it's a good idea to use Public Domain materials, or materials released under the Creative Commons license to avoid copyright infringement. Use any video editor available to you to edit your video together. PDB-101 offers a basic tutorial for Blender Video Editor. You will be uploading and sharing your video through YouTube, so the optimal composition size should be 1280px by 720px (HDTV 720). If your video shows footage/image and/or voice of a person who is not a member of your team, have them, or if minor, their parents/guardians sign the Actor Release Form. Email the Parent Permission Form for each team member (and Actor Release Form if applicable) to education@rcsb.org any time after January 15, 2019 and before you submit your video. Use the Submit link any time between January 15, 2019 and April 23, 2018 at 11:59 pm PST to register your video for the challenge. If you have any questions, please email education@rcsb.org. If you would like to receive monthly updates and educational news, please sign up using the button on the top.